For me this book has been a great tool for talking about a subject that... children are required to face. It provides a safe way of dealing with what I know they need to know, without alarming them. Look no further: the What's Happening to Me? books are nothing short of brilliant. 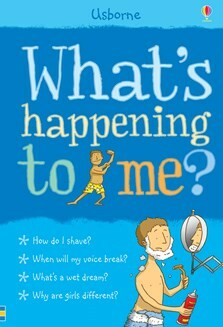 They aim to help children aged nine and above understand bodily changes and they do this extremely well... Reading these books will help young people to become more self-assured and feel more comfortable talking about their concerns. Adolescent boys will find this book answers a lot of their questions and help them to worry less about the changes taking over their bodies. Reading these books will help young people to become more self-assured and feel more comfortable talking about their concerns.